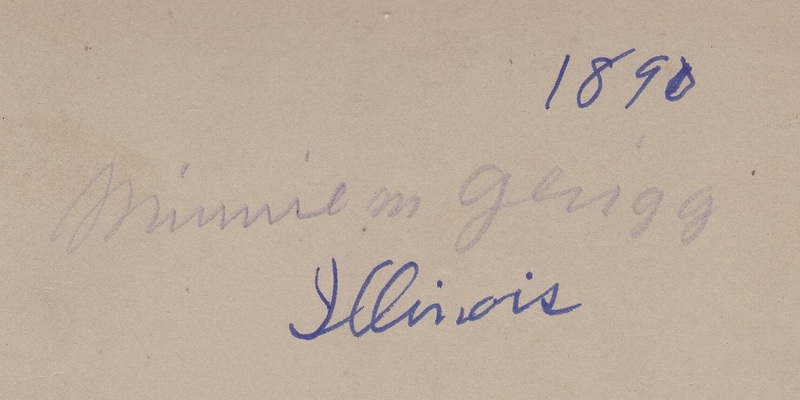 Written on the back is “1890 / Minnie M Gerigg / Illinois”. Or maybe it’s Grigg instead of Gerigg. Click here to see for yourself. This is the second one I bought at the bookstore this weekend. It’s a bit damaged, but I was fascinated by this image. I think we, today, have become so accustomed to seeing women demurely tuck their legs under themselves when in seated poses, that this woman’s posture looks ungainly. But she’s hardly the only woman I have from those days posing with feet forward and legs apart. Perhaps it was less of an issue when hemlines reached the floor? Perhaps it’s a deliberate pose to help display the volume of the skirt? Perhaps she truly needs that pose to remain balanced? I’m curious about what’s in her right hand. I would have assumed it was a parasol, rather than an umbrella, since her outfit suggests a sunny day. But I’m not used to seeing parasols that are black (or at least dark). Is it just a modern movie convention that parasols are supposed to be frilly and white? I’m intrigued by the fact that she has both a bow in her hair and a hat. Would the hat be worn over the bow, or is it just a prop for the photo? Also, I know it was the convention in those day to not smile in photos, but her expression really looks like she’s had more than enough of this posing business, poor thing. UPDATE: I answered my own question about women using black/dark umbrellas/parasols by watching this video. I’m marvelling at her tiny waist. Although she appears to have an ample bosom. Guess the old joke is true. Nothing grows in the shade. I noticed the waist, too, and wondered if she took any other photos in different poses. For all the effort she’s taken to create a tiny-waisted silhouette, she has nearly obliterated the effect by sitting down, particularly with the way the blouse hangs down in front and almost obscures the waistline. It’s not a hat, it’s a bun of plaited hair on top of her head. 🙂 And I don’t think she has a particularly large bust as another commenter thought – it’s just the shape of the blouse. 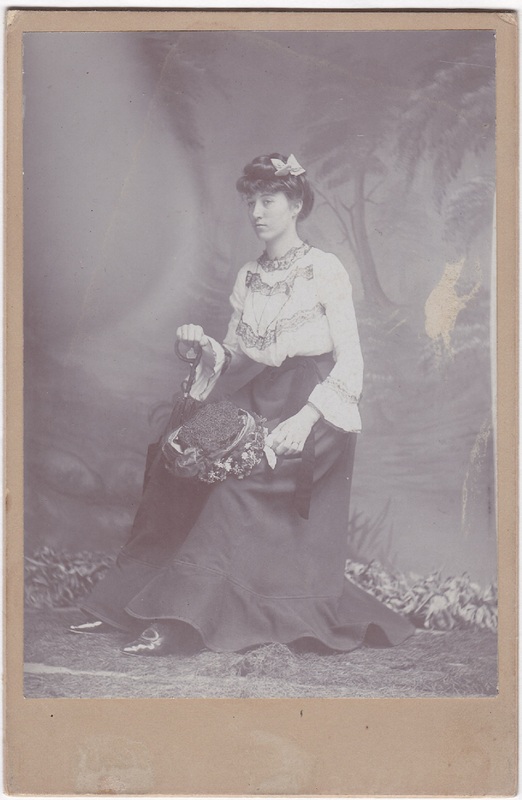 Her posture isn’t very good, I suspect she’s sitting on a box on which she can’t balance properly, hence the leg position… though some of that will be from the frill of her skirt – if straightened over her legs, it would have looked very odd. She certainly does have a very sombre expression on her face! Sorry if my comment was confusing. I meant the hat she’s holding in her lap. Oh and it looks to me as if her skirt at the back is over whatever it is she’s sitting on, which is most odd! Yes, I agree, it’s an odd choice, if that’s what’s going on.